We just got back from a visit to Disney World with my parents! As I was packing up the van, I had a slight how-did-we-get-here moment. I remember feeling "grown-up" when we started having to spend money on things like a new roof or our replacement HVAC unit, or even when we bought the minivan last fall. But traveling with baby gear oozing out our ears, a travel potty seat, and an entire bag devoted to wipes and (two different sizes of) diapers is a whole new level of times-have-changed. And it's awesome. I'm not sure if it was the full house moment preparing to depart or maybe our iconic destination, but en route to Disney I recalled an idea I had bookmarked several years ago--a family postcard album. I don't know where I initially came across it, but the idea is really simple: you buy a postcard from each vacation destination, journal some notes and memories from the trip on the back of it (and/or have the kids do this), and keep them together over the years in some kind of a flip album or even a coffee table box. What a treasure trove of memories! We will have pictures for sure (I took almost 1000 last week! ), but I love that this idea is kind of old-fashioned, and so tactile in a fast-paced digital age. 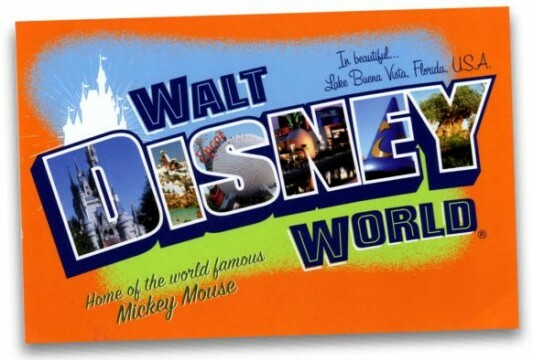 I can't wait to record some memories of our visit to Disney World onto our first postcard! It was so much fun to watch Reed love everything about the experience so enthusiastically. :) We would never have ventured to Disney at this stage in our lives without the invitation and extra hands of grandparents, so I'm super thankful we got the opportunity to take and enjoy Reed at age 2 1/2. (Thanks, Papa and Grammy!). And Molly was on her best behavior, as usual. Thankful for her smiles too! I hope to try to fill in postcards for all the places Matt and I have visited together since we got married! I also thought it might be a good idea to let each child pick and fill out their postcard, so everyone could have an eventual version of the album. Simple and meaningful. I love it! Do you have a similar tradition? Anything else you would add to the postcard album idea?